Does your private business need a winter gritting contractor? 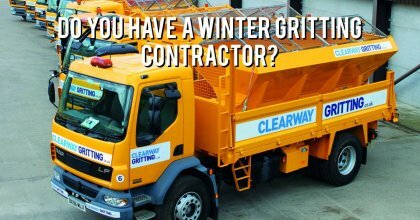 Do you have a winter gritting contractor? The south-east has experienced the first snow of winter this week. Motorists in the High Wycombe area of Buckinghamshire experienced difficult driving conditions and some people had to abandon their vehicles on the evening of January 22nd. As temperatures are forecast to stay around freezing the Met office issued an amber warning on Tuesday 22nd January as low level disruption is likely for drivers into Wednesday and beyond. Motorists are being warmed to take care in difficult driving conditions this week. ’If you run a private business you will need to keep pathways and entry roads, car parks and private roads adjoining your business gritted so that your colleagues and customers can get to your offices in heavy snowfall. Last year the severity of ‘the Beast from the East’ surprised everyone so it’s important that your business is prepared when the Met Office predicts winter snow. Our Clearway Gritting team work through the night when snow is forecast to clear private roads surrounding your business and keep you open even in severe bad weather and heavy snow. One of the key reasons our clients organise a winter gritting contract is so we grit their car park. Some of our clients are located close to main roads but if their workforce and customers can’t park it is very difficult for their business to open in heavy snowfall. We grit car parks for universities, retail car parks, school car parks, private business car parks and industrial car parks in counties across the south east.